Something really got to me in last week’s post. There’s a lot of talk around Christmas about being good, naughty and nice lists, and the spirit of giving and compassion. Which is awesome. But there are some things about it that bug me especially when, surprise surprise, they’re applied to children. Without taking song lyrics too seriously or literally, I can’t help thinking about Santa Claus is Coming to Town, where is says “He knows when you’ve been bad or good, so be good for goodness’ sake!” In one sense I imagine this as the cry of the stressed and exasperated holiday parent, and as another the careful attention to being good for the sake of goodness alone, and not for any other motivation. But with Christmas, that seems less likely. After all, the thing children hear most often is that Santa doesn’t bring presents to naughty children. Or he brings them coal. The way to win these presents is to be good, which usually translates as a muddy mix of obedience and compassion. Be nice to other people, but also listen to your parents and don’t cause trouble, etc. Which isn’t such a bad thing. The holidays are a stressful time, and being a parent is basically more difficult than it seems even in my darkest dreams. My issue isn’t even that it introduces problematic ideas about what it means to be good, so much that it turns being good into a transaction. Kids aren’t told to be good for goodness’ sake, they’re told to be good or a supernatural authority with the power to judge them won’t give them any gifts. In some ways this isn’t that strange. This is the life children lead, obey your parents in certain instances or there are consequences. That’s parenting. But parents have a direct relationship with their children. They arguably have some responsibility to help them try and be good people, and certainly have some stake in the matter. They have the authority to issue directives and if need be, punishments, directly because of the nature of their relationship with their kids. Santa has none of these. He’s a red-suited reverse-burglar who has somehow seized the moral high ground, which is conveniently located at the North Pole. Santa has nothing to say about the nature of goodness, and really does very little about it. People who are good and who celebrate Christmas will be rewarded. People of any moral quality who don’t celebrate the holiday get nothing, and people who are bad and celebrate Christmas get coal. His ability to dole out judgments in these matters is really little more than a function of his myth. If he didn’t do these things, he wouldn’t be Santa. Like if Johnny Appleseed didn’t toss appleseeds everywhere, he’d just be the unremarkable Johnny. 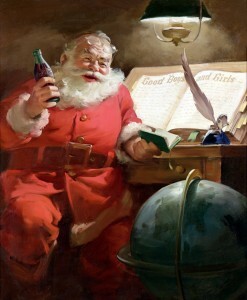 The act of judgment is essential to Santa’s nature, but how, why, what, and how much are all undefined. The god of the Bible is similarly judgy, but spends exhaustive chapters describing how to be properly obedient and further more on what constitutes a good person. I’m not going to comment on how good a job it is, but A for effort at least. Maybe I should just get over this whole thing because Santa isn’t real. Reading too much into it is a bit of a waste of time. But to children, Santa is real. We teach them that, and provide evidence to reinforce those beliefs. Letters get answered, NORAD tracks him on satellite, and you can meet him at the mall. And Santa offers them a simple deal. Be good and get rewarded. But this isn’t the world we want to live in. There are all kinds of times when being good isn’t rewarded, or it isn’t rewarded right away. It seems easy to agree that it’s better to be good for the sake of being good than for the promise of some reward, and more often than not the argument goes the other way. An action, no matter how helpful, isn’t altruistic if the person performing it is doing so in the expectation of compensation. Firefighters aren’t being altruistic when they save people, they’re doing their jobs. They’re brave and doing good things, but even an evil firefighter will save people if it means getting paid. I’d think that we want kids who do good things because they’re the right thing to do. Who are motivated by compassion and courage rather than the promise of a reward or the fear of punishment. Who do the best they can to cultivate those feelings and act on them when they’re called to, no matter the time or place. Kids who do that grow up into adults that do that, and those are the kinds of people we want to live and work with. The Santa Claus myth, in addition to being a tool for manipulation, can’t teach them that. There’s nothing in it about compassion or even charity. Santa Claus doesn’t give gifts because he cares about people, it’s just the thing that he does. Paul Bunyan chops down trees. Happily, there are other examples. Like the kid who thinks the Doctor brings him presents. 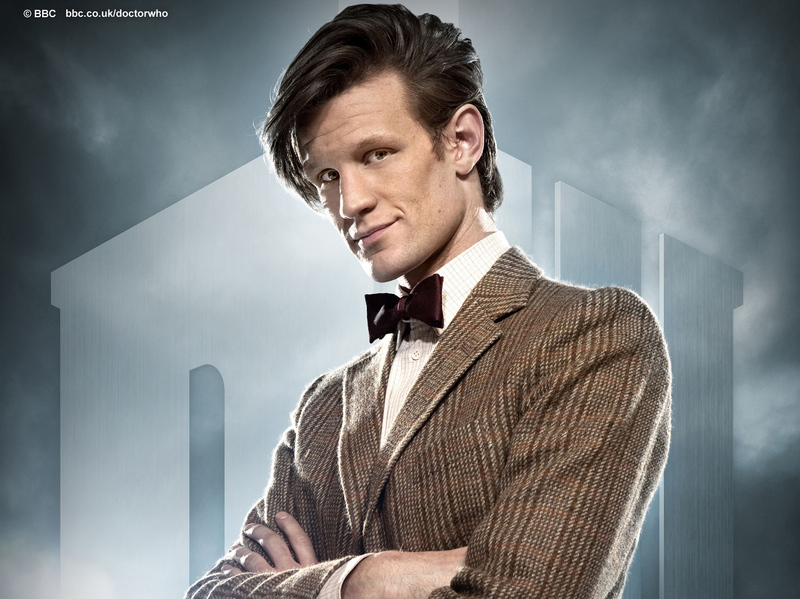 The Doctor is fictional too, but he’s at least a character instead of being a myth. He has values, and faults, and traits. He’s compassionate and brave and vulnerable and strange as hell. I don’t know that I’d hold the Doctor up as an ideal of goodness, but there’s certainly worse role models. The argument that the Doctor wants the boy to be good is simple and intelligible. The Doctor is good and values goodness, you admire the Doctor, so try and be like him. It’s textbook introductory virtue ethics. No one admires Santa. We only think of him once a year, and only when we want things from him.